Properties in Steamboat Natchez Dock average 4.6 out of 5 stars. Property 1: On Frenchmen Street - Whole House - With Courtyard! Property 5: A Beautiful Jewel Box... This House Is Painted Black ! Property 6: MARGINY'S SLICE OF THE CARIBBEAN --CHARM, CONVENIENCE AND COMFORT!!! Property 8: Historic Marigny Lofted Cottage Open Floor Plan WALK to Frenchmen St & Fr.Qrt. Property 9: 2-Story New Orleans Guest House-Walk to Streetcar! LEGAL GUEST HOUSE -Little Eazy-Want to support the city and not just the owner? Property 11: LEGAL GUEST HOUSE -Little Eazy-Want to support the city and not just the owner? Property 14: Newly Refurbished Cottage In The Heart Of The Marigny, located in a cat club. Property 16: Bywater Home w/ Garden | Walk to French Quarter! Property 28: Bywater Home w/ Porch | Walk to French Quarter! DESIGNER ART LOFT NEAR FRENCH QUARTER & FRENCHMEN--AWESOME LOCATION! Property 30: DESIGNER ART LOFT NEAR FRENCH QUARTER & FRENCHMEN--AWESOME LOCATION! Adorable Creole Guest Cottage, Steps To Shopping, Restaurants, And Parade Route! Property 32: Adorable Creole Guest Cottage, Steps To Shopping, Restaurants, And Parade Route! 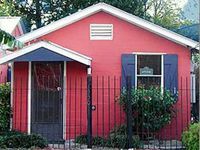 Property 37: Uptown Cottage...Experience New Orleans Like A Local! NOLA Creole Cottage - 5 Miles to Bourbon Street! Property 39: NOLA Creole Cottage - 5 Miles to Bourbon Street! Totally redone 3 bedroom/2 bath with NOLA charm, new appliances & furnishings! Property 41: Totally redone 3 bedroom/2 bath with NOLA charm, new appliances & furnishings! PEARL ST. GUEST COTTAGE OFF ST. CHARLES,30 NT. MIN. Property 42: PEARL ST. GUEST COTTAGE OFF ST. CHARLES,30 NT. MIN. NEW 2 STORY DESIGNER ART LOFT NEXT TO FRENCH QUARTER & FRENCHMEN ST! 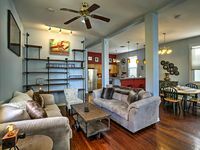 Property 43: NEW 2 STORY DESIGNER ART LOFT NEXT TO FRENCH QUARTER & FRENCHMEN ST! We had a fabulous weekend stay. Homeowner was more then accommodating and location is spot on! Plan on staying here again in the future! The &quot;Little Easy&quot; guest cottage was perfect for our week stay in New Orleans. We parked right in front and never had to move the car until we left at the end of our stay. It is only a short couple blocks to the French quarter and lots of wonderful music and food! With all that walking, we enjoyed the hot tub with a glass of wine every evening.